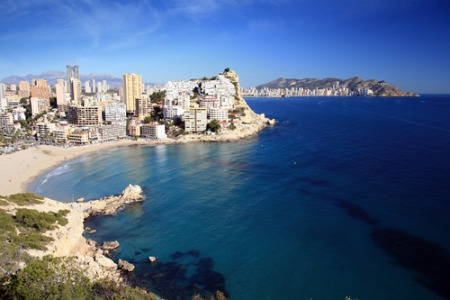 Cala Finestrat holidays take you to a purpose built resort close to Benidorm on the Costa Blanca. It has wide appeal attracting visitors from every age bracket. A relaxed resort, favoured by families and couples, its proximity to Benidorm with its renowned nightlife brings young singles wishing to chill on the beach by day and party through the night. They can have the best of both worlds. If you are looking for a guarantee of summer sun, a sandy beach lapped by warm, clear water, good provision of water sports, or even a golf course or two, a cheap Cala Finestrat holiday may fit the bill. The season lasts from April to October with the mercury rising into the thirties in the height of summer. Modern hotel complexes and high rise apartments provide for all budgets. Standards are high and service is very good. If you are taking a family holiday you may find that the Cala Finestrat all-inclusive holiday option is the best. While at first sight it may appear to be more expensive, when you consider the cost of snacks for ever hungry and thirsty children, you could be into pocket. At least you are certain to stay within budget. An abundance of restaurants cater for all tastes and are very much geared towards the British market with full English breakfasts and Sunday roasts. Shoppers have a wide choice with shops and markets in both the resort and in neighbouring Benidorm. Nightlife, unlike its gregarious neighbour, is fairly low key with many of the larger hotels providing evening entertainment. This area of the Costa Blanca has many tourist attractions and sporting activities. These include an exciting water park Aqualandia and the theme park Terra Mitica. If a Cala Finestrat holiday appeals but you find the thought of trawling through web page after web page looking for the best deal more than a little arduous, try our simple search facility. You'll find over three dozen travel companies, including leading brands, competing for your custom. It is simple to use, and remember, competition brings out the best bargains. Our search facility enables you to see, at a glance, the Cala Finestrat holiday that is the cheapest, and the one that offers the best value for money. It couldn't be easier. All you have to do to secure the holiday is make a phone call. As offers change daily, in order to avoid disappointment, you should ring today.